Mastering the Operational Complexity of IoT Applications –dynaTrace software, Inc. There is certainly no shortage of buzz surrounding the Internet of Things. Thanks to sharp declines in the costs of sensing technology and data processing, we saw momentum grow more last year than ever before. According to Harbor Research, some 4.3 billion new devices (excluding laptops and PCs) were connected to the Internet in 2015 alone. But for all the blinding spew of headlines and news events, we’re missing the deeper implication for connecting these billions of devices. Movement: The origin (e.g., location, time, date of initial packaging); where and when the meat is scanned as it moves from farm to distribution center to grocery and beyond. Actors: Those entities with whom the piece of meat has some interaction, from the individual packaging the meat at the farm, to the transporter, to the individual stocking the meat in-store, even to the purchaser. The point here is not that we’re adding a sensor to packaged meat, but rather that by doing so, we gain visibility into the movement, forces, interactions and environment which impact the meat and its movement through the value chain. IoT is about new services enabled. The visibility and context enabled through sensors is powerful, transformative even. But it’s only part of the story. When we add sensors and connectivity to objects and products, we can interact with them. This allows the function of a product to transcend the product itself and enable entirely new service layers. A good example of this can be found in a connected light bulb. 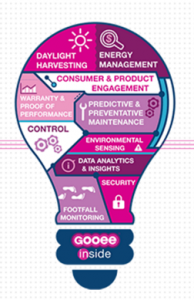 A smart light bulb isn’t merely about the ability to turn the bulb on and off from a mobile app, nor is it only about significant increases in energy conservation, although these are extremely important. A smart light bulb is about enabling new services through the interactions of the product itself, wherein the light bulb serves as an dynamic source of real-time data that informs new opportunities. What this means is that product-centric companies must now think beyond the physical form of the product and consider how the function, visibility, and interactions of/with the product create new value. This is, understandably, a fundamental hurdle for traditionally product-centric organizations to overcome. After all, if the focus shifts beyond the product, product manufacturers and retailers must consider significant modifications or entirely new business models. IoT is about the ecosystems. As we zoom out from sensors and connectivity, even from services enabled by any single product, what we find is that the greatest implications (and disruptions) the Internet of Things promises exist at the ecosystem level. While businesses have been incorporating data and electronic intelligence into their models for years, IoT ushers in an era where digital information becomes the core business asset. New services enabled by connected products break down historically siloed industries and stakeholders and connect value chains in ways that are, at first, difficult to conceptualize, or threatening to existing models. How do data and information impact these entities? How do these data and relationships enable entirely new modes of business? How can information platforms enable real-time value for diverse ecosystem players? Organizations must identify the dynamics between the diverse entities involved across the entire value chain, including technology suppliers, OEMs, integrators, retailers, brands, agencies, developers, end users, consumers and so on. As the economy continues to evolve towards networked business and collaboration models, understanding IoT through the ecosystem lens will separate the trend followers from the true innovators and disruptors. Ed Baldwin; I've read a number of posts with this same basic message; connecting gives visibility to the process. Taking the packaged meat example, this means visibility into the process of moving from slaughter house to the meat bin at your local grocery store. All true, and this basic example has value to the end-user by allowing the users at each point in the chain to control or reduce costs due to product spoilage. While I'm not fond of the term Internet of Things (IOT), my key point is we, industry, need to begin thinking differently about what I believe are three segments of IOT; Retail IOT (RIOT) (e.g. FitBits), Industrial IOT (IIOT), and logistical IOT (LIOT). In each IOT market segment we need to clearly identify the value proposition in terms of ROI/ROS ($) to 'the business', to our vendors/partners, and to our respective customers. Just because we can collect data or build a cool App, if that data or App doesn't show quantifiable value to the user, there is no reason or push for the user to change their behavior; purchase the product of service. Thanks very much for your comment, EBaldwin. 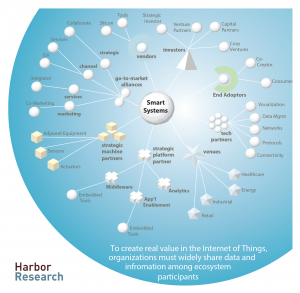 I agree we 'the industry' need to focus and specialize far more than the term 'IoT' alone, allows. I think the limited and confusing lexicon we have today is reflective of where the space is (i.e. early on, without large scale precedent, and poorly understood). As we continue to adopt these technologies and connected services, part of the natural maturity of this is the specialization of the nomenclature, as well as how businesses come to [more strategically] adopt it. This is where we will see greater clarity around actually defining the value prop, not just by industry, but by specific initiatives and use cases. Use case development requires companies see beyond 'visibility' as a value prop. This is where services models and ecosystem partnerships become central to long term value creation.